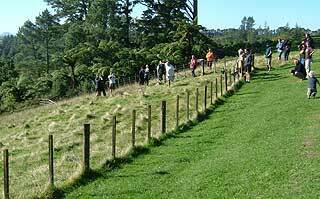 It always amazes me as you drive through the low cloud on top of the Kaimai’s and down the Tauranga side, the sun always seems to come out and the days are beautiful and this was no exception for the ‘2007 Tauranga Xtreme’ over the weekend of the 12th & 13th of May. The autumn colours in McLaren Falls Park were amazing and the crew of 24 players including a record field of 5 women was great to see. 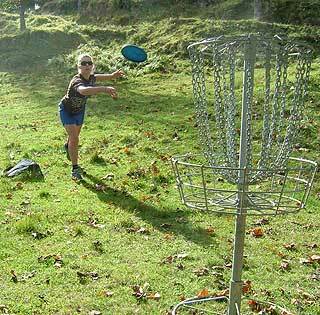 It’s a tough course for those of us that don’t throw from tee to basket in a direct route. Round 1 saw a two way tie at the top of the leader-board with both Marty de Haas and Seip van Vliet [The dutchies we’re at home in the Kaimai’s] coming in with a 60. Four over I know but it’s a testing course. Local Ming Menzies took the early lead in the women’s with a 72. After lunch we roped ourselves together and headed back out to take on the terrain for round 2. Marty de Chef played a blinder. I reckon he would have beaten Simon Feasey if he had have been there. 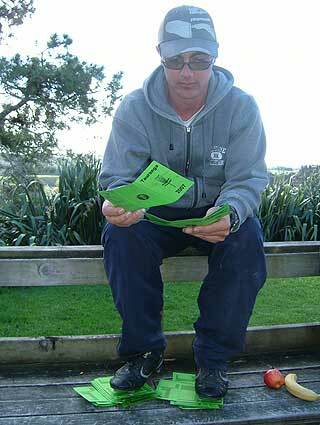 A course record one under 55 for the Auckland Freaky Stylist and the rest of us just stood there in awe. 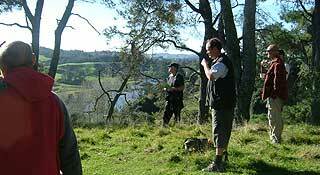 This saw the Ginga Ninja heading back over the Kaimai’s that evening for a home cooked meal and a decent sleep with a 9 shot lead over the chasing pack. 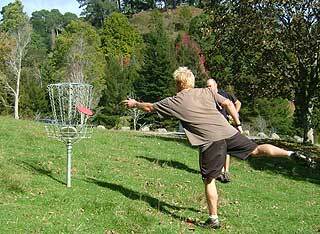 Sunday morning and the condies are beautiful for Disc Golf. To everyone’s approval the tournament this year was over 3 rounds, not the usual 4 with a cut to the top 6 for a ‘Super 6’ play off. The question is though, can Marty de Haas cash in on his monster lead? 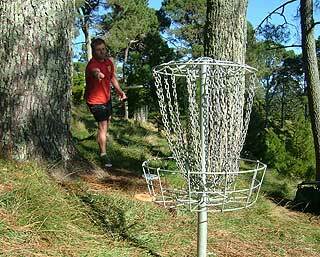 I’d dropped to the second group thanks to some pretty ordinary play on the Saturday afternoon so luckily wasn’t there to watch the carnage, discs in trees, rolling down hills, catapulting off the top of baskets. It wasn’t pretty by the sound of things, but the Auckland Freaky Styliest was still smiling. His lead had been demolished and he was now tied with the Lost Tribes Blair Joines for the lead - in fact there was only 4 strokes separating the ‘Super 6’ as we headed for the 15th Tee for the 6 hole play off. By the end of the six extra holes local Dean Marshall and Blair were tied for the title so the rest of us joined the gallery as they headed for extra holes. 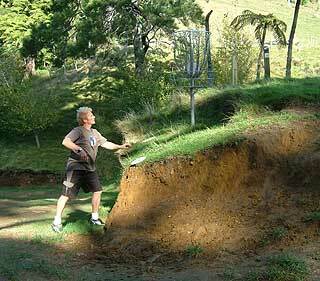 After them halving 4 holes the next basket was placed in a nasty position on the edge of a steep drop off. Blair parked his drive and Dean overshot the edge and dropped into the bushes. 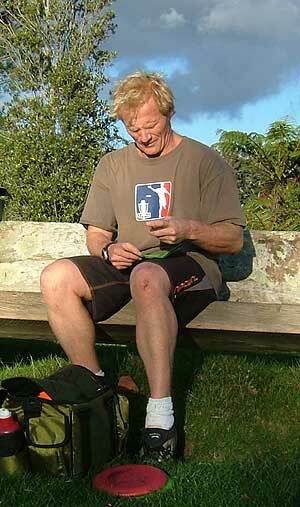 The basket placement had done it’s job and our Tauranga Xtreme champ for 2007 is the consistent Blair Joines. Local Ming Menzies took out the women’s; Marty de Haas took the consolation prize of the Masters title, Pete Boyle from the King Country the Grand Masters and the Lost Tribes Bruno Whale the junior title. 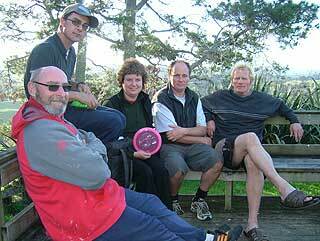 Congratulations to everyone for yet another great weekend on the New Zealand Disc Golf Tour. 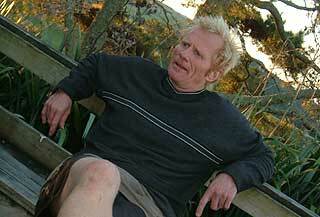 Marty the Ginga Slinger from the Auckland Freaky Styley DG Club ponders what might have been. 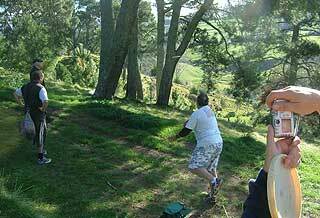 Hole # 14 and the Auckland restaurateur puts all he’s got into it to get as close to the pin as possible. 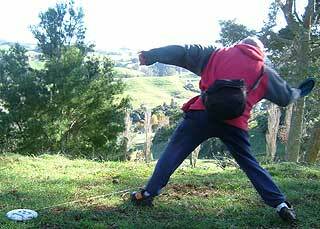 Its like that calf muscle is gonna explode! 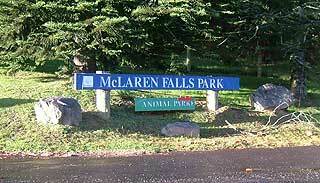 The McLaren Falls sign says nothing about ‘extreme’ but as we all Know by now .. it is. 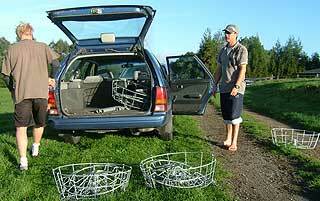 Auckland crew arrive bearing baskets, much to the TD’s pleasure. 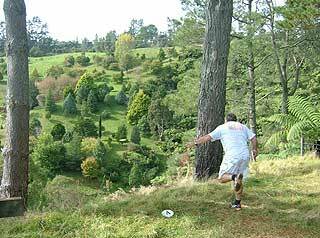 Local Tauranga golfer Andrew Taylor floats one tentatively down hill on the 12th. 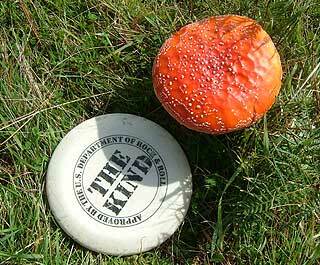 Toadstools the size of aviars. You had to be careful when it came to the schrooms. 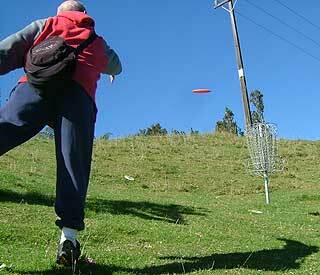 Marty de Haas bangs one into the chains on his way to the top of the field. Kirsty Williams, Allie [baby Madison] and Robyn Joynt part of the woman’s field of 5 along with the lost Tribe’s Cherie Blackburn and local Ming Menzies. 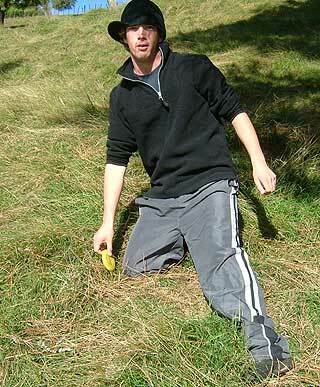 The Lost Tribe’s Bruno Whale poses for the camera as he makes the most of his last year in the junior ranks. 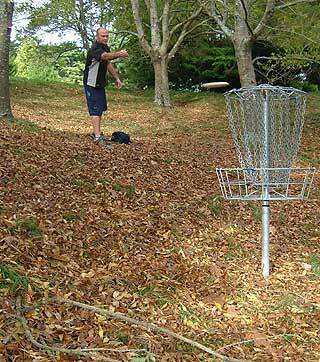 Waiheke Island’s Seip van Vleit is relieved to be picking his shot out of the basket on 18 and not climbing the 50 metres to the bottom of the hill as many did over the weekend. Pete Boyles Bag never touched the ground. He played 3 rounds and the super 6 with his bag across his shoulder all the way. It didn’t seem to upset his game one iota! 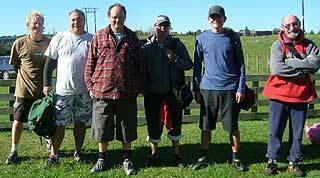 The Super 6 for Tauranga Xtreme 2007. Marty, Bob, Blair, Dean, Seip, Pete. Only 4 shots separated the 6 going into the final 6 hole playoff. 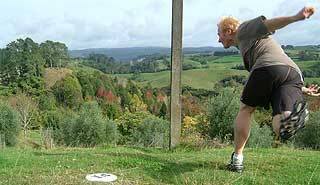 The GM’s putt for birdie on the Super 6 hole 3 [course hole 17] , the gasps went up as it hit the chains and spills down the hill. And the winners are; Pete Boyle Grand Masters, [Dean Marshall TD], Ming Menzies Woman’s, Blair Joines Open, and Marty de Haas Masters. The top of the nob hole #4 and the GM sends one down the line. Three times he tried this for a consistent 3 bogeys. Robyn Joynt putts out. It was great to have 5 women competing at a tour event. TD Dean Marshall gets the fours away for the final full round on the Sunday morning. 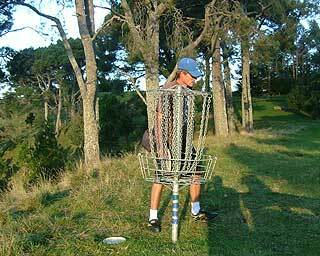 “You're joking!” thinks Marty de Haas “who the hell would put a basket there?” as he makes sure his putt sticks on the 3rd. Fish Seebeck sends a solid putt into the chains on #17, as he hones his skills for the Kiwi team's trip to World Champs in August. 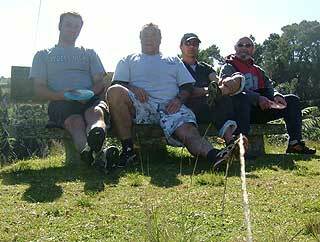 Fish, Bob, Dean and Pete making the most of the seat on Tee #11. Kirsty, Robyn and Cherie had a great little battle going as they played hole #14. The gallery watches as the GM sends one on it’s way down hole #17 on the Super 6 playoff. The Gallery watched intently as the Super 6 putt out on hole #18.